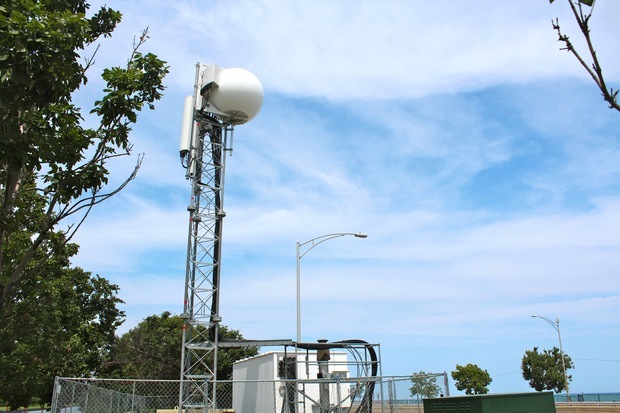 An AT&T "cell on wheels" antenna at last year's Chicago Air and Water Show, which the company says will boost cell reception. GRANT PARK — Seeing Sir Paul McCartney serenade Grant Park with "Hey Jude" is an occasion tailor-made for social media — and a log-jammed cellular network. Enter AT&T, which is rolling out a "Cell-On-Wheels," or giant mobile antenna that they say can handle up to 19 million social posts with pictures. The so-called COW, which carries 18 times more capacity than antennas used just four years ago, is making its Lollapalooza debut Friday after being used at last year's Air and Water Show, AT&T spokesman Phil Hayes said. The wireless provider believes the technology is essential as demand for data doubles every year at "major public events." Sprint — the official wireless sponsor of Lollapalooza — and Verizon Wireless also beefed up their networks around the park during the festival.